FUNERAL FOR A FRIEND: Michelle Sakoda, middle, wife of Army Sgt. 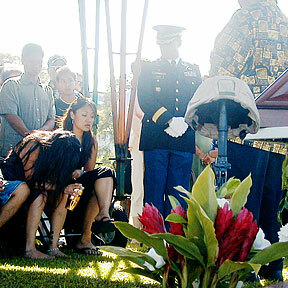 Steve Sakoda, sat during a burial for her husband yesterday in Hilo, as Stella Sakoda Hottendorf, at left, Sakoda's sister, sat with her head down. In the foreground, a helmet rests on a rifle planted upright in the ground. Several homes are evacuated as a 47-year-old man fires shots into the air. The 18-month-old is injured at a Kalihi chocolate factory. Martha Alexander's playful kids' tales warm the heart and reflect her zest for life. The meet goes down to the final event and Kahuku defeats Kamehameha by two. One of chef Peter Merriman's most tantalizing offerings was cooked up outside the kitchen. The state's tourism industry is looking for ways to allow visitors to experience the Hawaii culture. The National Security Agency has been secretly amassing the phone records of millions of Americans. President Hu's trip raises questions about the part China will play in relation to the United States.